If you’ve been following my blog very long you know that we take at least a couple of trips to Colorado every year. Although I love the time to catch up with my family and enjoy all of God’s beauty in Colorado, the drive with three kids is never the highlight. When my kids were younger I would go to the dollar bin at Target, Michaels or JoAnn Fabrics and get them a handful of cheap activities to keep them busy. For less than $20 total I could put together a shoebox sized kit of a few new and old activities for each of them. They seemed to love the surprises they would find in their boxes and couldn’t wait to check out what was inside – I never showed them what new items I bought until we were on the road. Now that my kids have gotten older I still pack a bag of art supplies and activities for them, although I don’t get much from the dollar bin and they help pack the bags. The collection of easily accessible activities continues to be really helpful – especially when I drive by myself and there is no adult in the car to help them. These small bags are a huge help on the road… giving them constructive activities to do, contained in a bag within their reach, and I know exactly what is in them to suggest ideas of what to do when they tell me they are bored. The drawback to these awesome little bags is that by the time we get home my kids have rummaged through them for over 20 hours – after the roundtrip drive – which means the contents are generally in complete chaos! This Christmas was no exception, and adding to the mayhem was an abundance of Christmas gifts that we HAD to keep accessible in the car. I started clearing the closet to sort ALL of the contents (my first step in any overhaul type project). Of course, I got up one morning, had my coffee and started my project on turbo speed without remembering a “before” photo… sorry! This seems to happen to me all the time… I am so excited to finally have time to conquer a trouble spot in our home that I’m 20 minutes into the project before it occurs to me that you all might want to see my disaster! I know some of you just like seeing the proof that disasters exist in my house 🙂 but I also know seeing before photos is motivating… encouraging you all that your chaos can get controlled too! 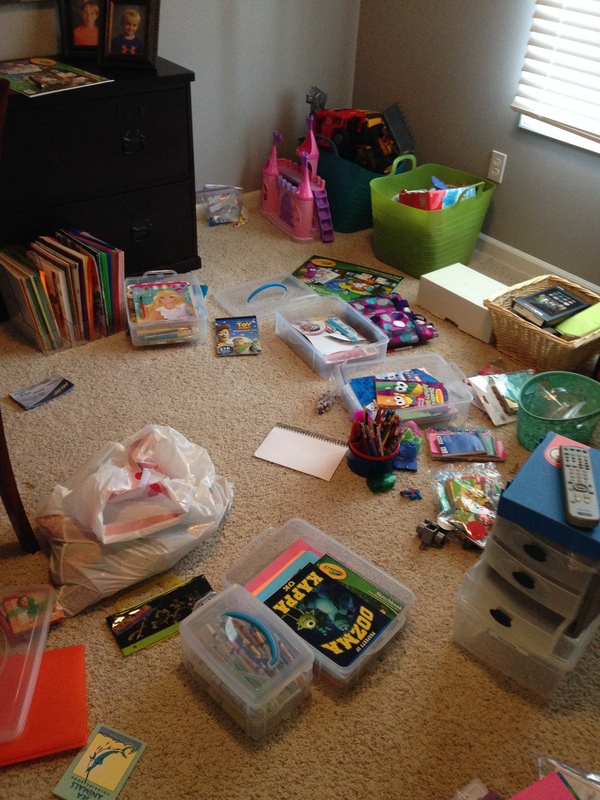 And here is my office with the contents of the closet and the activity bags all spread out. Umm, I’m the what…? The totally UNOrganized housewife! …it always gets a lot worse before it gets better! I made initial piles of items to toss, keep in the hall closet, take to the downstairs play area, or stash for another road trip. I like to keep a few things just for road trips, because we are in the car enough I need something “new” to keep the kids entertained. 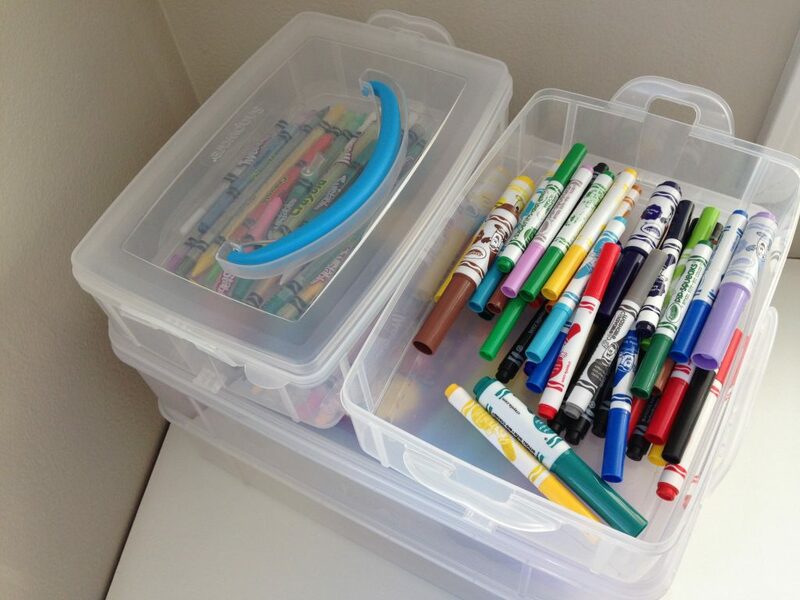 My favorite storage pieces for kids’ art supplies are these Snapware containers. I love them because they stack, clip together and have a handle to easily transport them. They also come with various sized compartments that allow for efficient storage of everything from markers, crayons, scissors, glue, and stickers to construction paper, coloring books and activity books. These are Snapware brand containers, which I use when I can. I have tried using other brands, but find the side latches can be too difficult for kids to open and close. 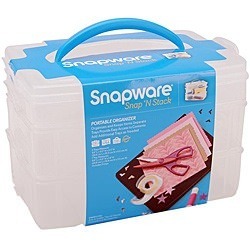 Target does have a different brand that seems to work fine, but I would suggest either finding the Snapware brand pictured above, (I usually get them at Michaels or JoAnn Fabrics) or be sure to test the side latches before buying a different brand. Side Note: Many of you most likely know this, but craft storage at both Michaels and JoAnn’s goes on sale regularly. I only buy their craft storage items when they are on sale or with a 40% off coupon. You can call or look at their online ads to see if craft storage is on sale before heading to the store. Once I did a quick sort of supplies, I began arranging things in our Snapware containers. The small stack is used to hold markers on the bottom and crayons on the top. I used a larger Snapware set for paint supplies on the bottom, and miscellaneous art project materials on the top. Both of these sets of containers went to the basement, to encourage the messier crafts to take place away from our main living spaces. It is not uncommon for me to get up in the morning and find my kids sprawled out on the living room floor with a variety of art projects underway. I would prefer not to wake up to a major paint project first thing in the morning! I have a second larger set of stackable containers for our everyday craft paper, stickers, coloring books & other activity books. 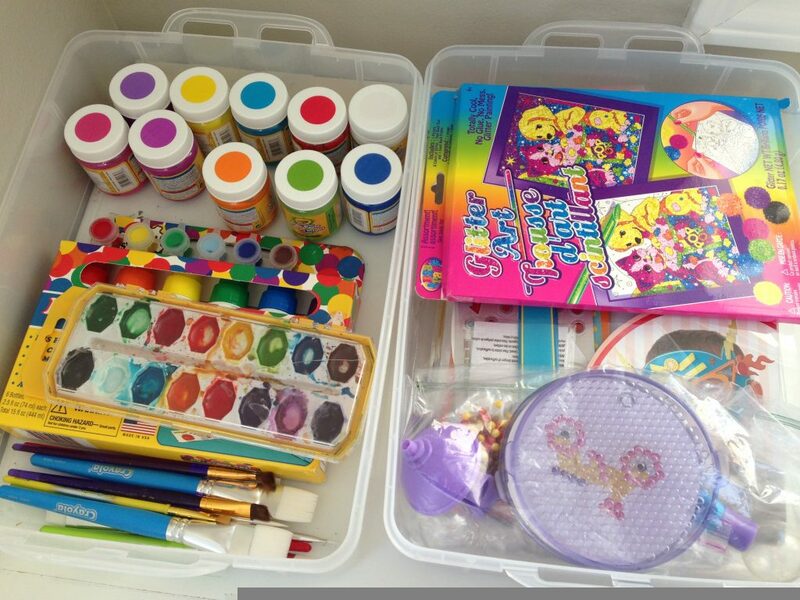 This set of art supplies will remain on the main floor in the coat closet. I also have a couple magazine files for some “special” books and paper in the coat closet. 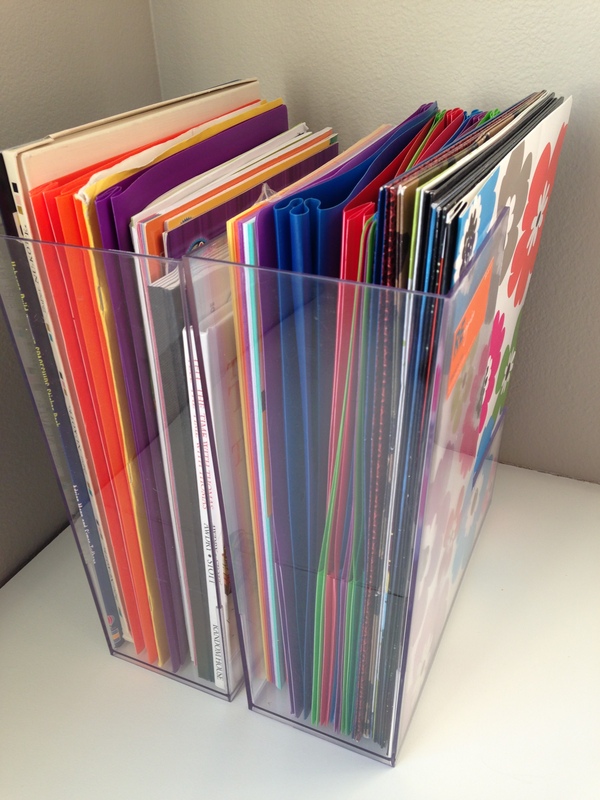 I love the very economical and durable clear acrylic ones from Target. One magazine file stores some “Learn to Draw” books and other special things that belong to my daughter, and could feasibly be destroyed by her little brother. I also have one magazine file for some quick access academic workbooks and another for extra school supplies (spiral notebooks, handwriting paper, and pocket folders). I know I sound a bit like a broken record to those of you that have been around a while, but boundaries are important! 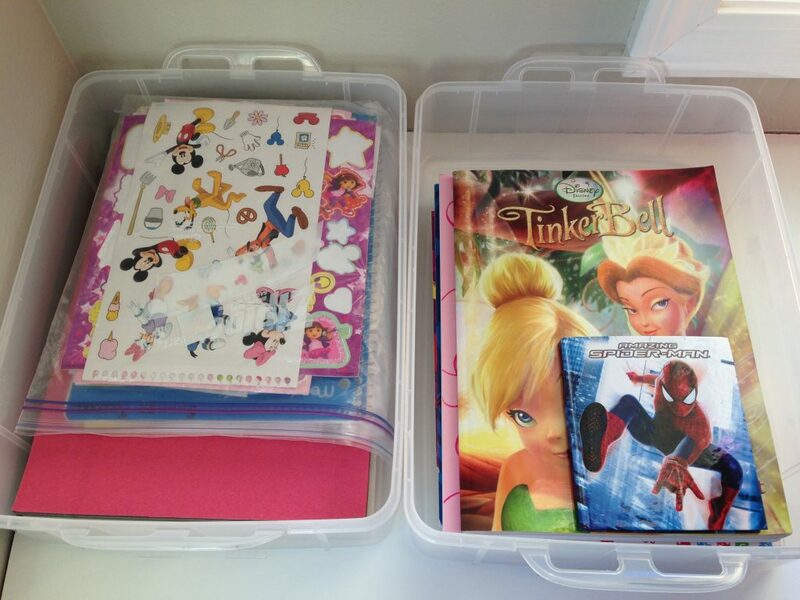 I like that these stackable containers and magazine files give us ample space to store supplies to help my kids be creative, but also limit how much they can have access to at any given time. 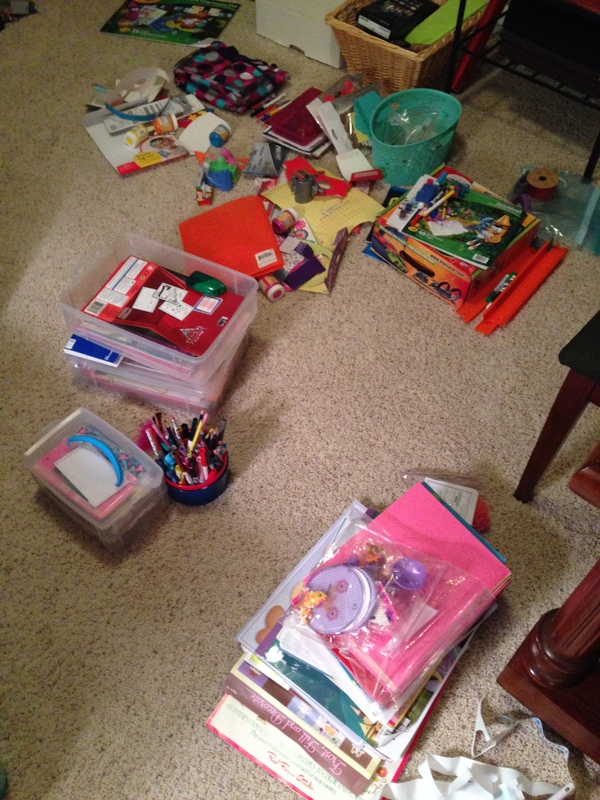 If they have accumulated extra from gifts, or road trip boxes I have a tote in our basement where I can store extra paper, coloring books, markers, etc… When kids have access to 20 coloring books they will color half of the pages in each. Then, they want to color in the newest books and you feel guilty throwing the old ones away – they still have half their pages empty, right! Limit the number they have access to and periodically go through and throw away well used ones and pull out some new ones. If kids have access to too much at any one time, it can be overwhelming and has a tendency to become a ginormous mess! But, that doesn’t mean I want to toss perfectly good art supplies. My storage tote in the basement storage room is where I store “extras”, and is also where I store those items that I want to save for road trips. To tidy up our coat closet, I basically just needed to purge and sort. For most of us we have a lot of excess, because our homes can handle it. 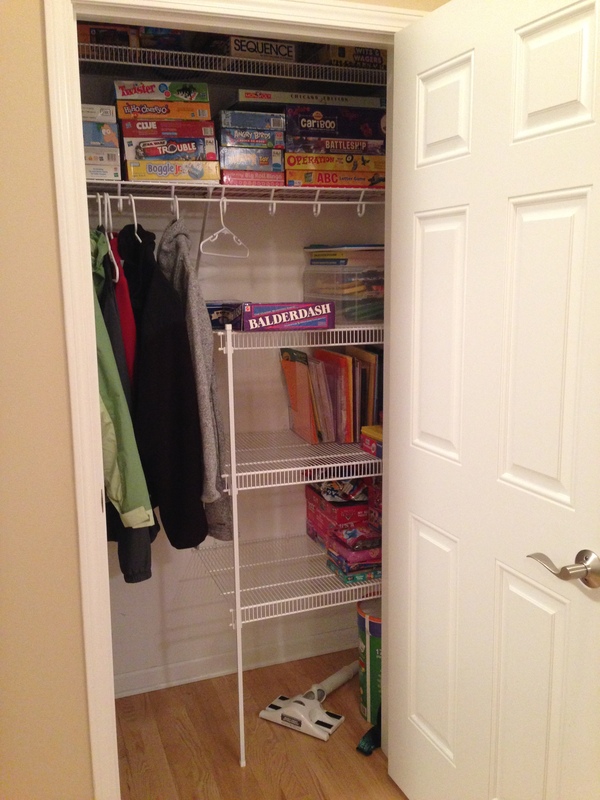 Just because your closet has room for 35 games, doesn’t mean your family actually plays all of them. The more stuff we have the harder it is to keep what we really use in good condition and in a convenient location. I definitely needed to get rid of some games we NEVER play, and relocate some to the basement to keep the stacks from being so overwhelming. We now have a closet with a well designated location and ample room for each category of items it contains. -The top shelf holds games, and there is one higher shelf (not pictured) that has a few more games our kids aren’t old enough to play yet. -The middle shelf holds art supplies for the kids… paper, coloring books, stickers, and a small caddy of makers, colored pencils, scissors, etc. -The bottom shelf is full of puzzles – which are pretty popular with our youngest two! 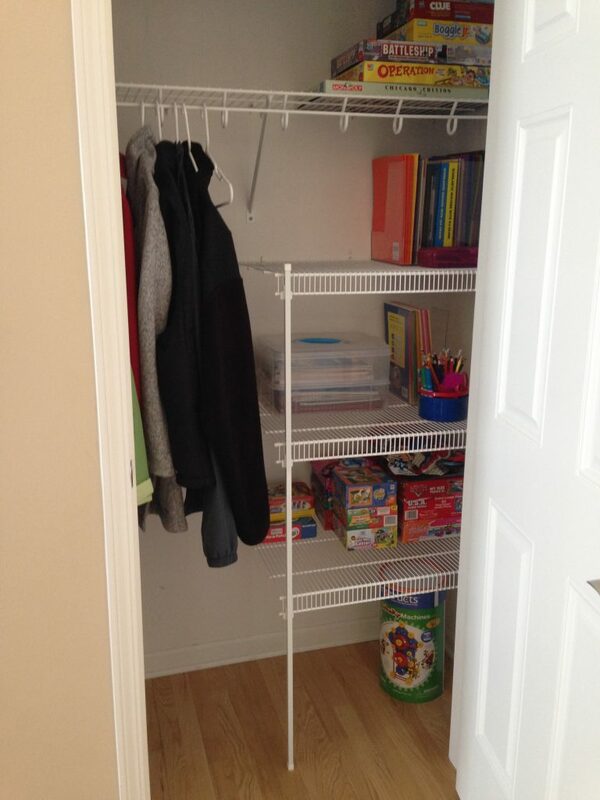 You can see that there is still plenty empty space to fill this closet with more toys and art supplies, but then again we really don’t need any more than what is in there right now! I’m big on purging and boundaries so that what we have is manageable and easy to take care of. I wouldn’t say this closet is cute, but it makes me happy to know there is order behind that closed door. I know what is in there, and everyone can easily find what they want. I won’t even cringe if company wants to hang their coat in our coat closet!